Easy and Advanced Way to Edit Your Video Shot by Android Phone. A sophisticated video camera is one of the "must-have" features of a modern smart phone. Due to various reasons, you may need to do some adjustments to the recorded video clips with your android device. Trimming and cutting are considered to be among the most common requirements. Let's have a look on couple of methods you can utilize to cut and trim videos on your android device. The first method to mention is a total free one. You do not want to install any third party app in this case. All we do here is using a hidden feature (which come by-default with android itself). First, open the default video player that can be found on your Android mobile. Then, select the recorded video and start to play it on your Android device. Now you should tap the menu button. It will bring up the settings menu related to video. You need to select trim from the list now. At this stage, you have to press down your finger to move the frame gently to select the start and end point as per your wish. Once the trimming process is done, save the result directly on your android and that's it! It is needless to describe the popularity of the Samsung smartphones. Because of its popularity, we have included a method that is dedicated to Samsung phones. This process is done by opening the Gallery or Videos. Just select your video and touch the three dotted button (the options button) that can be found in the upper-right corner. The go to “Edit -> Studio -> Video Trimmer”. Once the Samsung video trimmer is opened, you need to use the yellow marker in order to advance the video to the point where the video's action happens. Then you will have the freedom to select your start and end points. After trimming process is done with the desired video clip, select “Done”. Now, having a video clip done with the precise length, if you need to share it, just tap the three dotted option button that you find in the upper-right corner. Select “Share Via” option and you are ready to go. Here's how to trim a video using an external app in an android device. Install the AndroVid Video Trimmer first and launch it. Wait for few seconds until all the videos in your device get loaded. Select the video you need to edit. Select the splitting mode. Then keep the marker on the video timeline where you need to cut the video. Then you have to tap on the scissors icon that can be found on the top-right corner. Then the tool will start to process the video and split it into two parts. Once the processing is done, the system will ask you whether you like to replace the original or save them as a new video. After deciding the option, the new video will be saved. 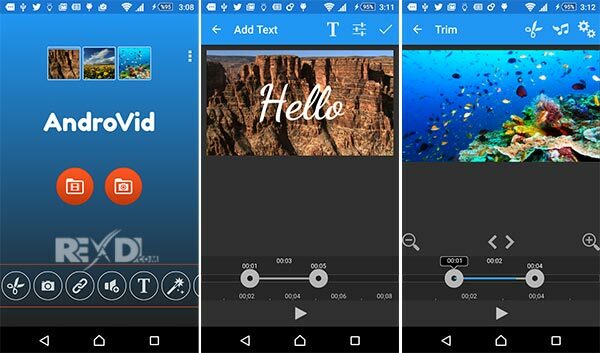 FilmoraGo is another app that you can use to trim the videos on android. The user interface is friendlier and there is nothing much to worry about. Or you can try our new Youtube video editing App vlogit. Just open the app and launch the video you need to trim. Then on the top side of the screen towards the right hand side, you will find the trim button. Click on the mark and then you need to define the length of the video. Once you complete the defining process you will be asked to save the clip. Depending on the quality of the video the processing time may vary with these apps. In addition to that, the performance of the phone and the features of the app may impact on the processing time. Thanks a lot for these tips! Video editing is my hobby. I like making cute videos and share them with my friends. As a rule, I use Viosk editing software ( https://www.viosk.com/ ). It helps me make my videos look absolutelly fantastic!